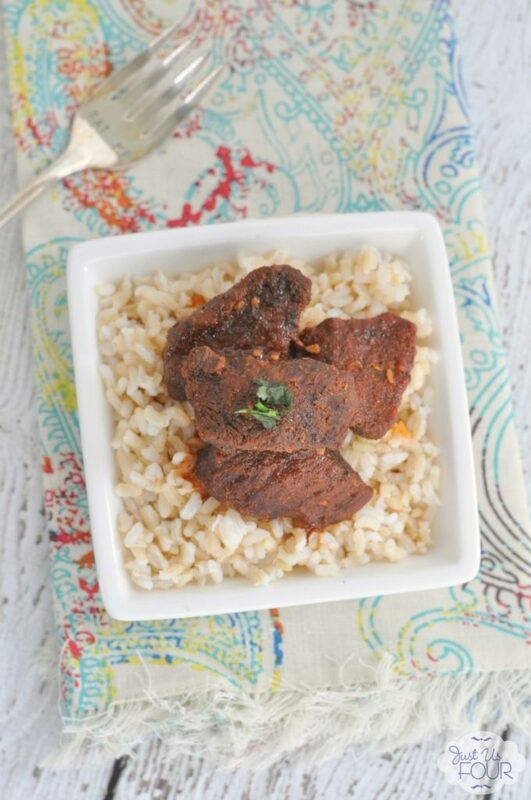 Now, I called this Paleo-ish balsamic beef because I showed it served over brown rice. That’s because my husband’s dish turned out the best and he is not really a Paleo eater. The braised beef is 100% Paleo and I eat it with roasted carrots to make the whole dish Paleo friendly. 2) Combine the salt through black pepper in a small bowl. Dip each piece of stew meat into the spice mixture and toss to coat. Place in a 2 or 3 quart baking dish with a lid. Add dates to the baking dish. 3) In a medium bowl, combine the tomato sauce, balsamic vinegar and garlic. Stir well to combine. Pour over meat. 4) Cover baking dish and bake in preheated oven for 3-4 hours. 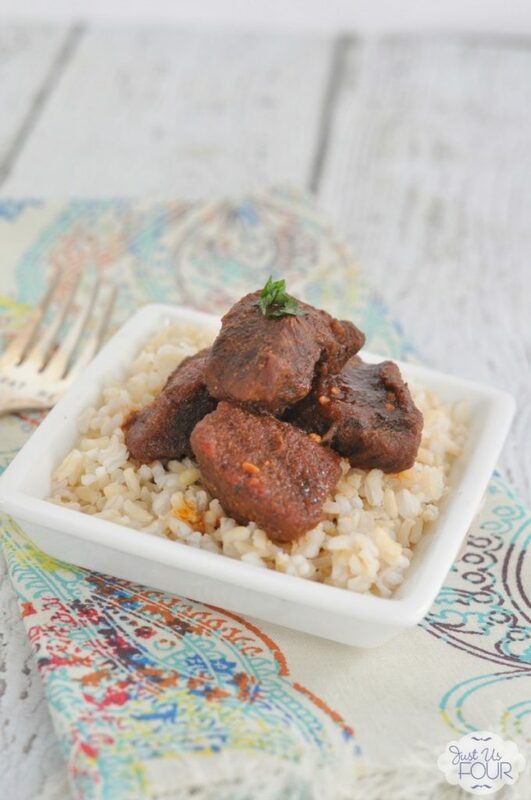 This balsamic braised beef is the bomb dot com…I am serious. I could have eaten the whole thing by myself but then I’d feel guilty for not sharing with my family. The only downside to this is how messy the baking dish gets. The sauce really bakes onto the sides and even the lid of the baking dish. So, just be warned! Combine the salt through black pepper in a small bowl. 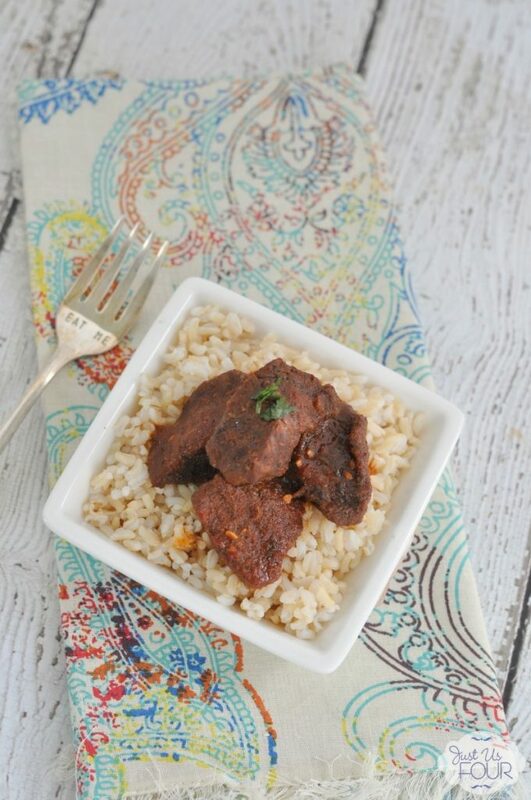 Dip each piece of stew meat into the spice mixture and toss to coat. Place in a 2 or 3 quart baking dish with a lid. Add dates to the baking dish. In a medium bowl, combine the tomato sauce, balsamic vinegar and garlic. Stir well to combine. Pour over meat. Cover baking dish and bake in preheated oven for 3-4 hours.